Just in time for the anniversary of the Trump presidency, this thought-provoking anthology features original short stories from thirty bestselling and award-winning authors. The literary world erupted in righteous anger whe Donald Trump became president elect in November of 2016. Many of America’s foremost writers and artists openly condemn the escapades of the new administration and they’re not about to meekly accept the new state of affairs. 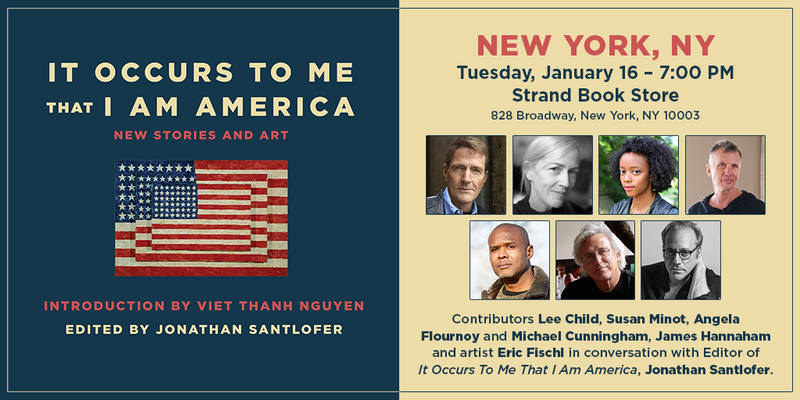 In It Occurs to Me That I Am America: New Stories and Art, dozens of the most acclaimed modern writers explore what it means to strive for a truly free democracy. Featuring artwork by some of the most politically active and concious cartoonists and graphic novelists today, this literary anthology is a must read for any citizen of this country concerned for the United State’s well-being. Join us in the Rare Book Room as a panel of contributors including Lee Child, Susan Minot, Angela Flournoy, Michael Cunningham, James Hannaham and artist Eric Fischl sit down with Jonathan Santlofer to discuss the collection. Please note: Participating authors will not be signing backlist titles, only the featured book: It Occurs to Me That I Am America. This entry was posted in Featured News, News and tagged It Occurs to Me That I Am America, Politics. Bookmark the permalink.